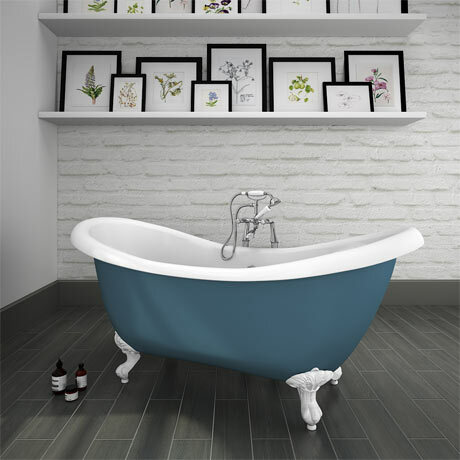 A stunning large double ended roll top slipper bath with traditional ball and claw leg set, enjoy the feeling of luxury with the Earl classical free standing slipper bath. This elegant double-ended bath is the perfect centrepiece for a traditional bathroom. The bath is mounted upon traditional ball and claw feet to complete a breathtaking appearance. Made with double skinned acrylic with a superb white and blue surface finish. Legs are available in Chrome or White, see additional images for examples. The baths are made from two 3.5mm sheets of acrylic with a fiberglass-resin filler layer which reinforces and insulates the bath. There will be an element of compression in the thickness due to the bath forming process but the advised overall thickness would be around 11mm.